When I visited Paul and Amy Kemp at their Loma Prieta Winery high in the Santa Cruz Mountains, Paul was all smiles as he had just the day before obtained a permit to have a tasting room and build a 4,000 square foot winery on his property. The struggle for permits lasted two and a half years. The property, purchased in the 1970s for a ridiculously small amount of money, has sweeping views of the entire Monterey Bay to the west and the majestic Mount Loma Prieta to the east. Paul has just finished building a beautiful home to allow him to soak in the views. Paul is still an active personal injury lawyer, but his interest in wine has led him to become a grape grower and winemaker. His 3-acre vineyard, planted in 2003 and maintained with the assistance of area viticulturist, Prudy Foxx, is laid out in front of his home. 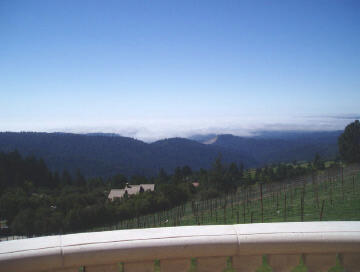 The photo on the right is taken from the balcony of his home looking west at the Santa Cruz Mountains and the fog shrouded Monterey Bay in the far distance. Amy tells me the sunsets are spectacular here. The vineyard has 2,800 vines, 2,100 of which are Dijon clones of Pinot Noir. The elevation here is about 2,600 feet. Being energetic and resourceful, Paul decided to produce his own wine in 2003 from purchased grapes. He used a consulting winemaker for guidance and essentially made the wine in his garage. He was startled when two wines were awarded gold medals: the 2003 Loma Prieta Cabernet Sauvignon won gold at the 2006 West Coast Wine Competition, and his 2004 Loma Prieta Pinot Noir won gold at the 2006 San Francisco Bay Wine Competition. He was flattered, but his intent is not to win medals, but to make wine he can be proud of, enjoy drinking himself, and sell a to other wine lovers. With planned production of 500 cases of Pinot Noir, he knows he will probably not make any money at it in the foreseeable future. Paul and Amy are shown below with their son and long-time friend. The Loma Prieta label is striking. 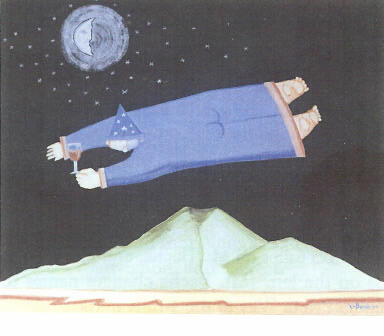 The artwork depicts a whimsical magician holding a glass of wine and flying over Mount Loma Prieta with an earthquake fault clearly visible. The artwork was specially commissioned by the Kemps and displays the work of Martin LaBorde (www.BeeGalleries.com) from New Orleans, Louisiana. LaBorde was born with a hearing defect, and spent the first twenty years of his life in a world of near total silence. As a result, his visual sense was heightened and he developed a rich inner life to compensate for that part of reality that had been denied to him. His artwork features a little magician named Bodo who lives in a spiritual landscape that is dominated by a deep black space. Several of LaBorde’s original paintings adorn the walls of the Kemps' home. 13.5% alc., $50. · There are plenty of attractive red fruit aromas in this wine with a nice touch of oak vanillin. Flavors of fresh cherries, earth and anise are set off by attractive oak notes in the background. The texture is quite gentle and softer than the 2004. 13.5% alc., 44 cases, $50. The grapes come from the Corralitos area of the Santa Cruz Mountains. · This is a big-styled wine in the sense of prodigious fruit, but it has a silky texture and soft mouth feel. The attractive aromatics feature black cherry, wet leaves, toast, and a hint of Jolly Rancher red candy. Flavors tend toward the earthy side with mushroom prominent. Plenty of ripe dark fruit coats the palate. The finish is a little warm, but there are nice oak and bittersweet chocolate memories. There is some limited distribution of the wines in the Santa Cruz area. You can contact Amy, who handles the sales and marketing at 408-353-4570. She is a real wine enthusiast and knows Pinot. The wines are also sold through the winery website at www.lomaprietawinery.com. Winery visits are available by appointment, but don’t head up there without strict instructions from Amy as maps and navigation systems are incorrect! The address is 26985 Loma Prieta Way, Los Gatos, but this estate is about as far away from the town of Los Gatos as you can get. It is an adventure driving there, but once you arrive, you will receive a warm welcome and a glass of Pinot as you succumb to the magical view.